At first learning to drive was quite an intimidating prospect for me, but less than a year later, I passed! I couldn't have done it without Isabel. She is supportive, patient and helped me to gain confidence both in preparation for the theory test as well as on the road. I now really enjoy driving and feel completely safe and comfortable when in the driver's seat. Isabel has encouraged me to gain independence and confidence. A huge thank you. After struggling learning to drive, with other instructor's over many year's. I finally decided to give it one last go. 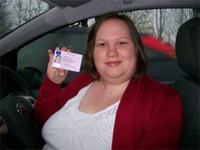 As an instructor, Isabel is encouraging and patient and has the ability to understand your driver issues rather quickly. There were times I never thought I'd even get to my test let alone pass it, I'm so happy I chose to drive with Isabel and LDC Driving School, as I feel I'd still be struggling now. So happy to have passed and have gained not only confidence, but also more independence. I put this down to Isabel's teaching, guidance and encouragement enabling me to pass my test! If I could pass the test, anyone can! Seriously, I could not have done it without Isabel. I had three instructors before he. I was not progressing. I really wanted to give up, but my mother suggested trying with a lady instructor. That's how I found Isabel. I was really lucky as Isabel is extremely patient and professional. What is most important she helped me to be finally confident behind the wheel. Thank you Isabel. 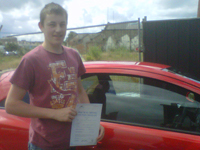 With a first time pass Liam is now all set to get an apprenticeship as a plumber. Margaret gave up learning to drive as a youngster after a bad crash. 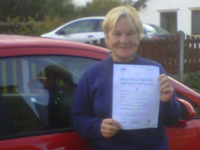 Now at 62 she has passed first time so that she and her husband can still go and teach their Scottish Dancing classes. Isabel was amazing at helping me pass my test - I never thought I would have passed in such a short space of time. She is very patient and I instantly felt relaxed in her presence. I would highly recommend Isabel to learn to drive with. Thank you! 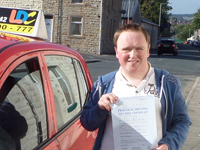 "I knew that learning to drive wouldn't be the easiest thing I had ever attempted in my life. I'm not the most co-ordinated or confident of people and at the ripe old age of 36 wondered if I'd left it a bit too late. I chose Isobel because she was local and could fit lessons around my very varied work and home life. Isobel is so patient and started to put me at ease within minutes of first getting into the car. 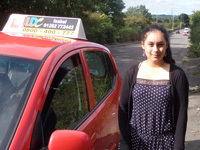 I found that as well as helping me with the practical side of driving, her warm and friendly approach to teaching also built my confidence and before I knew it, I was off and driving. There were so many things about driving that I didn't want to try- but Isobel was always there, re-assuring me and trying different techniques in a variety of ways until they clicked and the nerves went away. Isobel introduced new things when she knew I was ready to try them - as I said earlier - confidence was a problem for me - so we always discussed what was worrying me, approached things in a step by step way and she was always right to introduce them when she did. In the run up to my test we discussed and concentrated on the things we both felt needed some targetted attention. 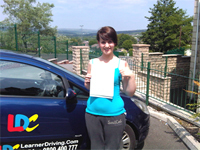 Then on the morning of my test, Isobel was just so good at putting my mind (and nerves) at ease that I passed - first time." Isabel is an excellent instructor and I passed first time. I highly recommend her plus you get a great driving workbook. My name is Emma. I'm 30 years old. Last June I decided that I wanted to learn to drive. I have attempted a couple of lessons when I was younger but never felt confident enough to carry on. Last May I bumped into an old friend who said that he had learnt to drive with Isabel and strongly recommended that I take up lessons again with Isabel teaching me. I had my first lesson at the end of June 2009 and from then on Isabel made me feel at ease in the car although she knew how nervous I was. It took me 10 ½ months of driving lessons and then I was put in for my test. 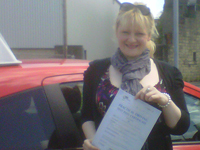 Although by this time I felt confident with my driving I never thought for a minute I would pass first time, but I did! For anyone out there thinking of taking up lessons, no matter how nervous you are, do it! If Isabel can get me to pass my test, she can with anyone. 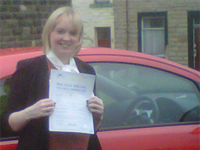 I am now a competent, confident and very happy driver and I couldn't have done it without Isabel. After previously failing two driving tests and having a break from driving altogether for 6 years, I made the decision to begin learning again. 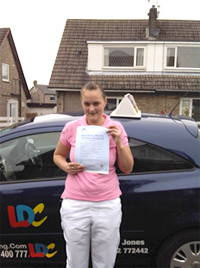 Isabel was extremely good at recognising the poor areas of my driving which we were able to work on. This gave me a new sense of confidence on the road and the ability to drive with less anxiety than I had done previously. Thanks to Isabel's patient and professional manner - my third driving test resulted in a pass. Highly recommended! "Deciding to learn to drive is a massive decision as is choosing the person you wish to teach you. I can honestly say that deciding to learn to drive with Isabel was definitely worthwhile. She took the time and had the patience to teach me thoroughly and didn't rush or put any pressure on me to do more than I was ready to at any point which meant that I felt confident on the road. This ultimately meant that I passed my driving test first time which is exactly what every new driver wants and I would heartily recommend learning to drive with Isabel"
I would definitely recommend Isabel. She is patient and calm and never gave up even when I felt like it sometimes. I was initially nervous about learning to drive so getting the right instructor was important to me. After my first lesson with Isabel I realized I had nothing to worry about. 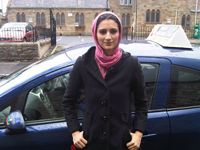 Her friendly yet professional attitude made my lessons and enjoyable experience, and I felt I learned at a good pace. She was always reliable and punctual and I think the results speak for themselves, I passed first time!